The CW has released an official description confirming the title and air date for the first episode of Arrow to feature “The Flash” Barry Allen. The episode will air December 4, and here’s the write-up. For more Arrow Season 2 spoilers, go here. BARRY ALLEN COMES TO STARLING CITY — A seemingly impossible robbery at Queen Consolidated’s Applied Sciences Division brings Central City police scientist Barry Allen (guest star Grant Gustin) to town. 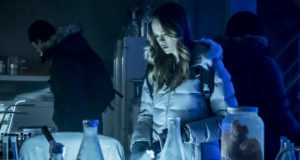 Citing a similar case back home, Barry offers to help Oliver (Stephen Amell) and team with the investigation. Oliver senses there is more to Barry than meets the eye, but he’s distracted by the similarities between this current case and something that happened on the island. Meanwhile, Felicity (Emily Bett Rickards) takes a liking to Barry, which doesn’t go unnoticed by Oliver. Sin (guest star Bex Taylor-Klaus) asks Roy (Colton Haynes) for help when a friend of hers goes missing. 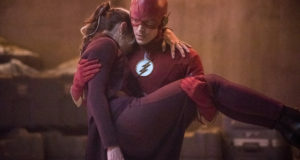 Roy is surprised when Thea (Willa Holland) not only encourages him to help, but joins the search. Unfortunately, Sin’s friend is connected to Brother Blood (guest star Kevin Alejandro), and their search ultimately gets one of them seriously injured. Michael Schultz directed the episode with story by Greg Berlanti & Andrew Kresiberg and teleplay by Andrew Kreisberg & Geoff Johns (#208). Next: Arrow “The Scientist” Images: Grant Gustin Makes His First Appearance As Barry Allen! Awesome!! Can’t wait for this episode and “Three Ghosts”. Also hope to see some of The Flash’s supporting cast in episode 20 like Iris West and maybe even Wally. I like the way the writer give a believable reason why Barry Allen travel from Central City to another city. It will be interested to see how many Flash’s future rogue gallery will appear in the future series.